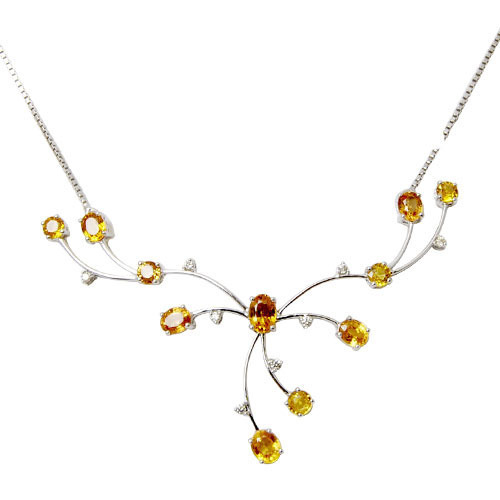 0.13 ct diamond, 4.68 ct yellow sapphire, 18k gold necklaces sapphire jewelry necklace, yellow sapphire jewelry design, best necklace jewelry collection. We are an eminent name engaged in manufacturing, retailing, wholesaling, exporting and supplying the finest range of Diamond Jewellery, Gold Jewellery, Silver Jewellery and Gemstone Jewellery. Our wide range of products comprises of Diamond Rings, Diamond Earrings, Gold Rings, Gold Pendants, Silver Rings, Silver Earrings, Gemstone Pendant, etc. The offered products have massive demand in both, national and international market for their high durability, excellent finish, impeccable design and superior quality. Also, we are processor and supplier of Precious & Semi Precious Stones. We are committed towards providing the best quality, latest designs and client oriented services at competitive prices. Owing to a team of skilled and creative designers, We are able to offer an exclusive and magnificent range of offered products. We have an advanced and sophisticated infrastructure that facilitates us in completing our consignments within the promised time frame. Further, our team of quality experts deeply examines our entire range on various parameters to ensure that we are offering our customers unquestionable range of products. We are considered as a reliable name in this domain due to our association with Gem & Jewellery Export Promotion Council (GJEPC), Jewelers Association (JA) and Rajasthan Chambers Of Commerce & Industries (RCCI). Further, we are able to congregate huge client base across the world, owing to our ethical business policies, easy modes of payment and transparent dealings.